KIM LAWTON, correspondent: It’s Sunday morning at Sixteenth Street Baptist Church in Birmingham, Alabama. Sunday school has finished, and the 11 o’clock worship service has just gotten underway. Today, the youth choir is singing. This is how things were supposed to go on that Sunday morning 50 years ago as well. Then a bomb made of at least ten sticks of dynamite exploded, killing four young girls inside the church. FREEMAN HRABOWSKI (Univ. of Maryland, Baltimore County): It shook the very fabric of our society broadly, not only in Birmingham but in the country. Because if four little girls dressed in white for Sunday school can be blown to pieces because of hatred, everyone has to stop and think, where are we going as a society? 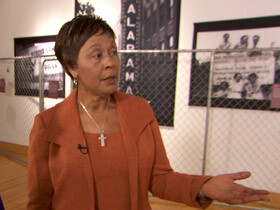 LAWTON: The bombing came amid ongoing racial turmoil in Birmingham and across the US. At the beginning of 1963, Reverend Martin Luther King Jr. had decided to make Birmingham the center of a new non-violent campaign to end segregation. 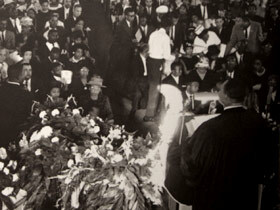 For years, many Birmingham churches had been fighting segregation under the leadership of Reverend Fred Shuttlesworth. But the largely middle class Sixteenth Street Baptist Church had not taken an active role in that effort. Glenn Eskew is professor of history at Georgia State University and author of the book But For Birmingham. PROF. GLENN ESKEW (Georgia State Univ. ): When King arrived in Birmingham to join in the demonstrations that had been organized with Reverend Shuttlesworth and the local movement, he was surprised to find that 16th Street Baptist was not one of the movement churches. LAWTON: Because of shared Baptist connections, King persuaded Sixteenth Street’s pastor, Reverend John Cross Jr. to let him use the church as his headquarters for civil rights rallies. Then in early May, Sixteenth Street church became the staging ground for a series of demonstrations featuring students, some as young as elementary school age. The children gathered in the church and then came out singing and marching. They were met with police dogs and fire hoses. Hundreds of young people were arrested. Their bravery inspired adults to join in, and the mass protests created a huge challenge for the city. In the wake of the demonstrations, white leaders in Birmingham had agreed to begin dismantling segregation. By late summer of 1963, African-Americans were starting to be hired in some local businesses. But most controversial of all were new efforts to integrate public schools. With tensions in the city high, Sixteenth Street Baptist was trying to return to business as usual. ESKEW: Having gone through the demonstrations in the spring of 1963 it had become seen as a symbol of that successful protest movement but the congregation itself had not completely embraced the protests and wanted to go back to a kind of normalcy. LAWTON: Reverend Carolyn McKinstry was 14 years old in 1963. She had marched in the children’s crusade that May and was at Sixteenth Street Baptist on the morning of September 15th. She and her friends had been in Sunday school and were getting ready for the worship service. REV. CAROLYN MCKINSTRY (Author, While the World Watched): We were especially excited because it was Youth Sunday. This meant that we were in charge of everything. LAWTON: McKinstry remembers chatting with four friends who were in the restroom. Then, because her job was to collect the Sunday school reports, she headed up to the church office just before 10:20. MCKINSTRY: The phone in the office was ringing. So I went in and answered it and the person on the other end, the male caller on the other end said, “Three minutes.” And just as quickly as he said that, he hung up the phone. And so I’m holding all of these materials and I just began walking and I take about 15 steps into the sanctuary and then this bomb just explodes. ESKEW: The explosion ripped through the side of the building, blew out the granite foundations, the bomb having been placed under an outside staircase going up to a second story landing and door. MCKINSTRY: When I first heard the windows crashing in and it felt sort of like the earth shook, the building moved or something, and then the windows came crashing in and I heard screams. LAWTON: There was significant structural damage and multiple injuries. Then amid the chaos, came the more devastating news. Four girls had never made it out of the restroom: Addie Mae Collins, Carole Robertson and Cynthia Wesley, who were all 14, and Denise McNair, who was just 11. MCKINSTRY: I knew so clearly that it could have very easily been me. 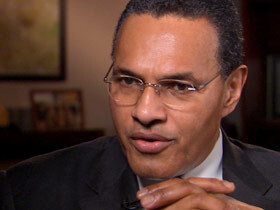 LAWTON: Freeman Hrabowski is president of the University of Maryland, Baltimore County. He lived in Birmingham and was 12 that year. He had also marched and been arrested in May. HRABOWSKI: It was like war. Because the point was, if a church can be bombed and little girls killed, no one’s safe anywhere. LAWTON: In the aftermath of the bombing, blacks and whites clashed in the streets, and before the day was over, two young black men had been shot to death. 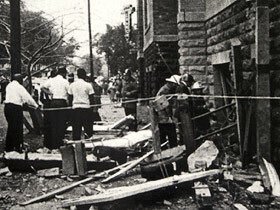 The bombing shocked people outside Birmingham, especially because it had happened amid optimism after the successful March on Washington less than three weeks earlier. ESKEW: That exercise of true democracy that had just transpired was really shattered by this explosion in Birmingham. And for many in the nation, it awoke them to just how difficult this task was going to be. LAWTON: But it also galvanized people in the north and the south to lobby even harder for the Civil Rights Act, which was signed into law the following year. Hrabowski attended the funeral service that was held for three of the girls in his church, Sixth Avenue Baptist. HRABOWSKI: I saw people of all faiths there. It was the first time I’d ever seen somebody white in my church. And there was this long line of these people who were devastated. And there was something about that that was, was transformative for me, to see that whites care about little black girls. LAWTON: King preached the funeral sermon, telling the crowd that suffering can be redemptive and the means to ultimately bring light into darkness. HRABOWSKI: And Dr. King looked at these mothers and said, "Life is, can be as hard as steel." He was saying all we have is God and our faith. Can’t explain this, all we can do is pray. And that, that was the essence of what we all had to say. LAWTON: Suspects affiliated with the Ku Klux Klan were identified within days of the bombing, but the FBI closed the case five years later with no indictments. Robert Chambliss was finally convicted of murder in 1977. Two more men were also eventually convicted in the case, the last one not until 2002. McKinstry grew up to be a Baptist minister and wrote a book called While the World Watched. MCKINSTRY: My focus is just forgiveness, reconciliation, restorative justice, learning...number one, to put the past behind, to forgive, but also learning, looking for those times when there may be a way to restore, justice and hope. LAWTON: As the nation marks the anniversary of the bombing, many say the real message must never be forgotten. ESKEW: We’ve changed so dramatically in the past 50 years, but we need to be aware that humans are capable of all kinds of things, and that we must forever guard against this kind of violence from taking place. LAWTON: With the help of many donations from around the world, Sixteenth Street Baptist Church reopened in June 1964. The events of 50 years ago still resonate with the youth here. IVAN HALLOWAY: They didn't know that the bomb that they put in this church was going to make such a big deal that it ended segregation basically. LAWTON: Sixteenth St. Baptist Church has been designated a World Heritage site. But Pastor Arthur Price, Jr. says they don’t want to be defined only by their past. REV. 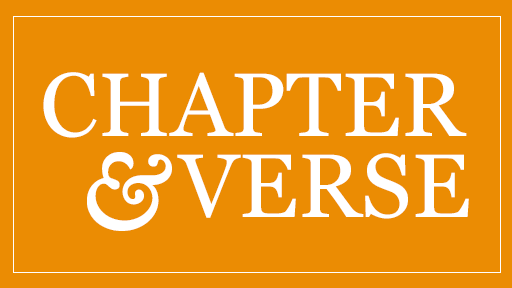 ARTHUR PRICE, JR. (Sixteenth Street Baptist Church): We embrace our history, and we see it as a opportunity to tell people about the grace and glory of God, how God, in his providence spared this church so that they could have a story to tell about his goodness and his mercy. 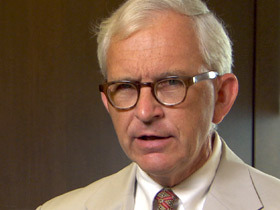 LAWTON: Price says the church continues to stand as a national testament to how tragedy can indeed turn into triumph. I’m Kim Lawton in Birmingham. Fifty years after it was bombed, Sixteenth Street Baptist Church stands as a witness to the violence and suffering of the civil rights era.